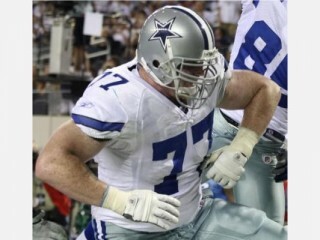 Birthplace : San Diego, California, U.S.
Pat McQuistan is an American football offensive lineman for the Miami Dolphins. Drafted in the seventh-round (211th overall) of the 2006 NFL Draft by Dallas ... Traded from Dallas to Miami on September 3, 2010. 2010 - Started four games when John Jerry was inactive due to illness and played in a reserve role three games this season ... Made his Dolphin debut in a reserve role on Sept. 12th at Buffalo. 2009 - Was inactive for the first nine games of the season before seeing action on special teams through the final seven…Was inactive for both playoff contests ... Saw his first action of the season on special teams against Washington on Nov. 22. 2008 - Saw action in every game - mainly on special teams ... Took a few snaps at left tackle in place of Adams against Cincinnati on Oct. 5 ... Replaced Cory Procter at left guard in the third quarter of the season finale at Philadelphia on Dec. 28. 2007 - Saw action in every game - mainly on special teams ... Played at right tackle in place of Colombo on the team's final drive against St. Louis on Sept. 30 ... Relieved Adams at left tackle on the final drive against the N.Y. Jets on Nov. 22 ... Recorded his first NFL kickoff return for 12 yards against Philadelphia on Dec. 16 ... Played at left tackle for the fourth quarter at Washington on Dec 30. 2006 - Made the active roster out of training camp as a backup tackle to Adams ... Had two starts in the preseason when Adams was out with a bruised calf ... Inactive the first 15 games of the regular season ... Made his NFL debut against Detroit (12/31), playing mostly on special teams ... Played on special teams in the wild card game at Seattle (1/6/07). Played in all 11 games in 2005 at Weber State, helping the Wildcats go 6-5 after they went 1-10 in 2004 as the offense averaged 381.2 yards-per-game and finished with 2,466 passing yards and 1,727 rushing yards ... In his first season at Weber State, played in 10 games at tackle and guard ... Enrolled at Weber State during the summer and sat out the 2003 season as an academic redshirt ... Originally signed to play at Weber State in February 2002 along with his brother, Paul, but was declared academically ineligible ... Enrolled at Edmonds Community College and played baseball for one season. Patrick Shawn McQuistan attended Lebanon, Ore., High School ... Earned second-team All-Valley League honors as a defensive lineman and honorable mention All-Valley League as an offensive lineman and punter as a senior ... Was a business major at Weber State ... Twin brother, Paul, was selected in the third round (69th overall) by the Oakland Raiders in the 2006 NFL Draft ... Paul and Pat are the youngest of seven children ... He and his wife, Amy, were married in July of 2007, and they have one son, Zac.